I am a beginner in exome-seq and have tried to get a threshold of p-value for significant mutations using QQ-plot. 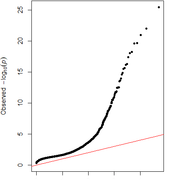 However, I couldn't because my QQ-plot looked very weird. I couldn't figure it out whether it is a something wrong or not, and how I can explain or fix it. I really appreciate your kind comment. I am going to start with it. Is there any good tutorials for basic exome seq?